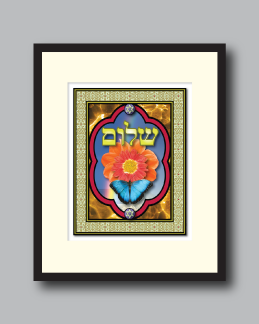 Jewish Symbols :: "Shalom I"
The inspiration for “Shalom I” comes from the multi-dimensional meanings of the Hebrew word itself. “Shalom” (שלום) is often used as a salutation for hello and goodbye, but also means “Peace”. Its closest English translation is “wholeness” and "wellness”. 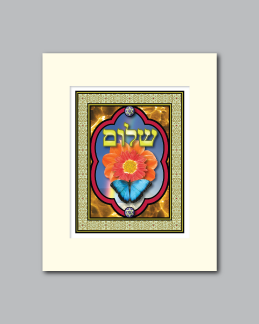 The background of this art piece depicts a shimmering golden ether that surrounds the floral motif in the center. This ether is a reminder that G-d’s spirit is all around us, supporting us from all directions. 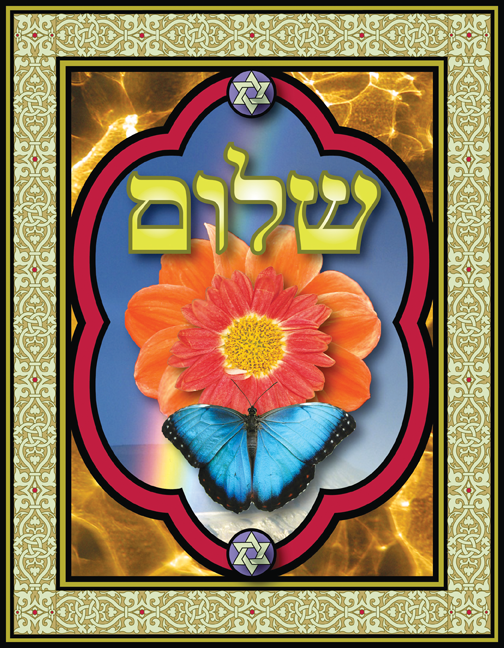 Within the floral opening is an open blue sky with a rainbow, the symbol of G-d’s life affirming covenant with our people. Over the rainbow, two blossoming flowers represent the beauty and harmony of our world. A delicate and graceful butterfly reminds us of the fragile quality of Happiness and Peace.